The work is the same. The network is different. One classic agency showed its new face to the world today following nearly two years’ worth of restructuring moves, staffing changes and new financial reporting standards—not to mention the usual ins, outs, ups and downs of the ad world. Seventy years to the day after copywriter David Ogilvy decided to launch his own operation in Manhattan, the company that bears his name announced its “re-founding” as a creative network that “Makes Brands Matter,” according to a new tagline. Along with this positioning comes a new logo, color scheme, website, organizational design, consultancy practice, digital platform and employee video. The film below, which traces the history of the agency from its founding to the present day, preceded an announcement beamed to all of the network’s 15,000-plus employees around the world. Ogilvy revised its logo font along with a brighter Pantone red and a a subtler palette including grey, pink, blue and yellow. According to the press release, these developments symbolize Ogilvy’s desire to modernize while hewing to the principles that made it stand out in the first place. 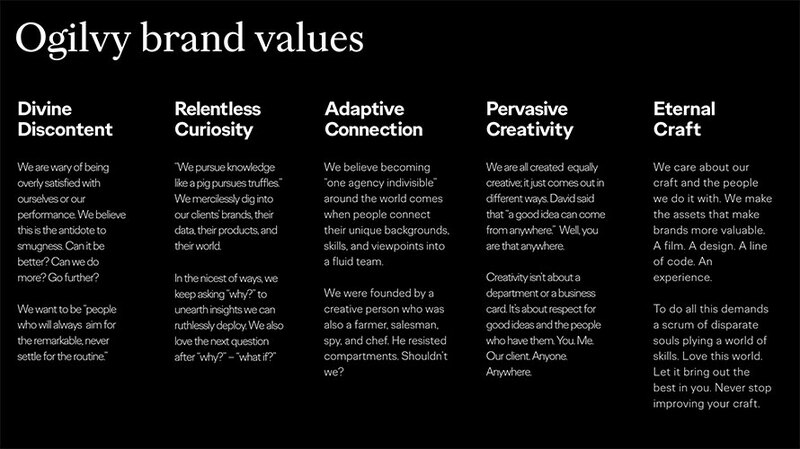 Beyond the visible changes, Ogilvy and Collins also created a new positioning based on five key values determined by leadership. In many ways, this new Ogilvy is not so different from the organization we’ve come to know. 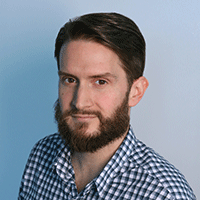 Some key elements of the classic lineup, however, are now missing—chief among them the network’s many practice-specific sub-brands like OgilvyOne, Ogilvy PR, Social@Ogilvy and Ogilvy CommonHealth Worldwide. In place of these divisions come 12 “crafts” (Creative; Strategy; Delivery; Client Service; Data; Finance; Technology; Talent; Business Development; Marketing and Communications; Administrative; and Production) and six “core capabilities” (Brand Strategy; Advertising; Customer Engagement and Commerce; PR and Influence; Digital Transformation; and Partnerships) that will define the network. Now, the company operates as a single brand combining its direct marketing, creative advertising and public relations divisions In that respect, the new orientation resembles the new U.S. structure announced in April, which had one executive leading each practice-based team. Ogilvy Consulting, the new enterprise offering pivoting off the success of OgilvyRED, will work across all other parts of the organization. The goal of this extended and sometimes challenging effort, according to worldwide chairman and CEO John Seifert, has been to clarify what Ogilvy is—and, just as importantly, what it is not—as the industry’s oldest agencies struggle to assert their identities. “This is the next chapter, not the last chapter,” Seifert said, adding that agency leadership hopes the new positioning better emphasizes to employees and clients why they want to work at Ogilvy and with Ogilvy, respectively.